There’s nothing quite as attention-grabbing as free stuff. People genuinely love free stuff, even if it’s something simple. The great people at 307 Mysteries knew this and decided they wanted a few items they could hand out to get their business noticed. Luckily, our team at SignBoss worked with 307 Mysteries before and they knew exactly who to call to help them out. 307 Mysteries is a really neat business located right here in Gillette, Wyoming. They do escape rooms that will keep you coming back for fun and mystery. Their portable rooms are one of the coolest aspects of their business. They build their escape rooms in RVs, trailers, and mobile homes. That allows them to come to you as well as you coming to them. As we said, we were lucky enough to have worked with 307 Mysteries before. Lezlie Kitzinger at 307 contacted us because she wanted to have something that people could take with them to remember their business name and contact information. She thought a few of our trade show items would be perfect. So, we spoke to Lezlie and got right to work on the items she wanted. The client asked for a few types of items. She wanted a pop-up banner, some really neat puzzle pens, magnetic custom calendars, and some regular pens as well. The whole process took about a month and we delivered exactly what the client asked for. Lezlie loved the puzzle pens. These were a great addition to 307’s advertising considering their escape rooms are giant puzzles themselves. 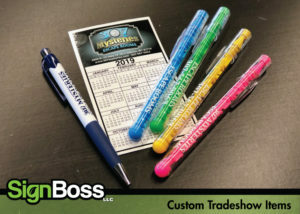 Handouts like these are really great for giving out at your business, but also work really well at tradeshows and any other event you may be attending. They grab attention and give your customer and potential business partners a great reference for remembering and accessing your name and contact information. We were really happy to work with 307 Mysteries again and create such interesting items for them. If you’re interested in similar items or other displays and handouts that work great at events, contact the SignBoss team to talk about your options.